When I saw Sarah's post announcing the next edition of Dine & Dish, the first thing I thought was "Matt is going to love this". Sarah's picked 'ASIAN PERSUASION' for this month's theme, and if there's anything you should know about Matt, it's that he loves Asian cuisine. Chinese, Thai...it doesn't really matter. He'll eat it. Now, I come from a very different background. My childhood cuisine was more along the lines of pork chops and mashed potatoes, Irish beef stew, and fish fries. I don't think my hometown even had an ethnic restaurant until the end of my high school years. To say I had very little exposure to Asian dishes would be...pretty accurate, actually. I'd had sweet and sour chicken from the questionable (I say this because it was often being hit for health code violations) Chinese restaurant at the shopping plaza a couple of times. But that was it. As a matter of a fact, the last meat-based meal I ate before becoming a vegetarian was that very dish! A year or so into my vegetarian lifestyle, I discovered the 'ethnic' section (a very small shelf) of my local grocery store. I started making fried rice at home, using veggie ham. I began experimenting with 'weird' ingredients like water chestnuts, bamboo shoots, wontons and tofu. But I was still far from adventurous. It took months to try tofu, and it's a rather benign food! After I moved to California to be with Matt, I was exposed to so many new foods, and new ways of preparing them. Though it took much coaxing, Matt convinced me to try sushi (you wouldn't believe how staunchly I resisted!). Once I did, I quickly fell in love with it. Using fake chicken bites, we started making stir fry at home. And I loved it. But I was (and probably am) still very much in a comfort zone: I knew what I liked, but I wasn't quite ready to branch out and try new things. So, Dine & Dish provided me with an opportunity to change my ways. Or, we could have gone to one of the many Chinese restaurants in Knoxville...sweet and sour tofu, anyone? No...I wanted something different. Something new. I did a local restaurant search, and discovered that, in addition to the countless Japanese and Chinese places, there were Thai, Vietnamese, Filipino, and even (2) Korean restaurants here! Matt liked the idea of trying Korean, as he'd only had it once before (KAL flights, The San Francisco-Seoul legs of the trip to Nepal). And I was game. So, for the dinner portion of our 'dinner and a movie' date night (we saw 'Good Night, and Good Luck. 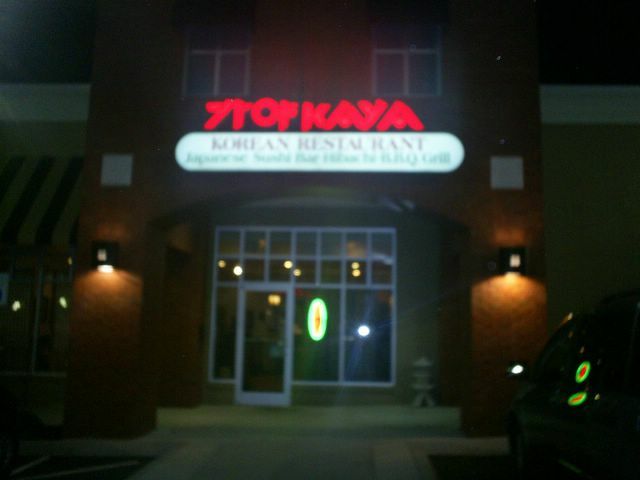 '...which I highly recommend), we headed to Kaya; a simply decorated Korean restaurant in the 'nice' part of town; West Knoxville. Situated in a high-end shopping center, Kaya doesn't look like much from the outside. Ok, it doesn't look like much on the inside, either. When we walked in, the first thing we both noticed was a strong cigarette smoke smell. After living in California, we've still not entirely adjusted to 'smoking or non?' questions from servers. At Kaya, we weren't even given a choice. We were seated shortly after walking in, and it soon became clear that we weren't going to be the staff's top priority that evening. Off the side, in what we imagined was a more traditional seating arrangement, was a small, sliding-screen door section. Behind it were seated a large group of noisy Korean men, shoes off and having a good time. And clearly...a little bit drunk. The two women running the floor were scurrying like their lives depended on it to cater to their every wish, so I was worried we'd end up sitting around and staring at the enormous paper lanterns all night. Fortunately, our waitress (the other one was a total Korean doppleganger for my good friend, Erin) came out and was both friendly and attentive...although she probably lost five pounds just running between the kitchen, our table, and the noisy drunk guy's room! Without a menu to consult, I ordered an ice tea (they only had unsweetened); Matt, ice water. Later upgrading to hot green tea. Once we were seated and handed the rather-sizable menus, the real fun began. I'd thought ahead, and sent off an email to Sarah, asking for recommendations. My biggest concern...any time I dine out, really...is 'will they have meatless entrees?'. Lucky for me, Kaya had a decent vegetarian section, and I had to make a decision between two different dishes in the end. 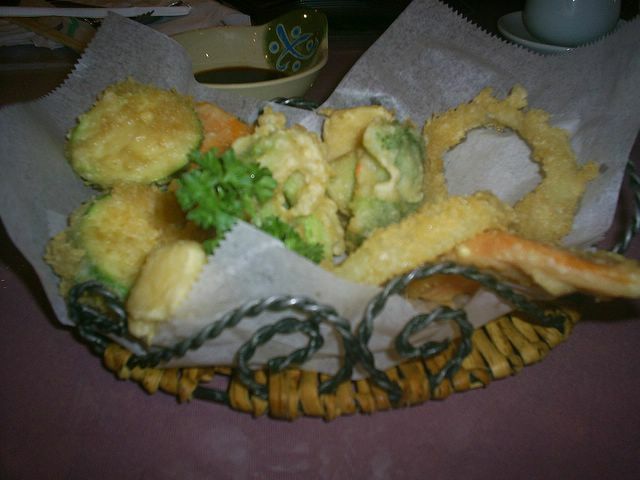 But first, we started with a Vegetable Tempura. The tempura batter was fantastic (when will I finally get this right at home? ), but I was surprised at the vegetables. The wide carrot, onion, and zucchini slices, as well as the broccoli spears, were merely waved in the direction of a heat source. Completely crunchy. I'm used to a more 'done' tempura, but that didn't mean I wouldn't eat it! Before we could finish the tempura, our dishes arrived. 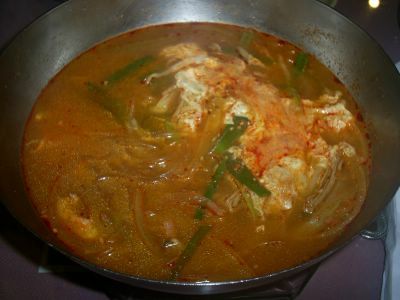 Matt ordered the Yook Gae Jang; a very spicy stew. He ordered it 'medium', but kept saying throughout the meal 'wow, that's hot!'. And no, he wasn't channeling Paris Hilton. I'd never marry a man who would do that. I choose the Dol Sot Bi Bim Bap; rice, lettuce, carrot, bean sprouts, cucumbers, and spinach topped with a fried egg and served in a sizzling hot stone bowl...with a side of chilli paste. I quickly got over my 'this is really weird, eating an egg over rice with steamed veggies' mind-set, and (even using some of the chilli paste), cleaned my bowl! But I liked it! I really did. It was different. But as I've learned over the last decade; when it comes to food, different doesn't have to be a bad thing. The vegetables were just lightly cooked, and the chilli paste really gave the rice a little kick. Mixing the fried egg into every bite brought a new flavor to the mix, also a good one. With our main selection, we were served a variety of 'side dishes of the day'. I can't really tell you what those dishes are, as our harried servers were much too preoccupied with LoudDrunkKoreanGuys (LDKG) to answer any food-related questions. As best as we can guess, (clockwise) lettuce (seasoned or marinated), kimchi, cucumbers (seasoned or marinated), bean sprouts, and sweetened potato slices. As I already had lettuce, cucumbers and bean sprouts in my dish, I skipped them. I haven't yet gotten up the nerve to try kimchi, so a 'pass' on that, as well. But after Matt tasted and identified the potato dish, I finished them off! Oh, they were good. I added them to my rice, and the sweet oil in which the potatoes were coated was incredible. And because it was Dine & Dish, we decided to get a dessert, too. We ordered the Tempura Green Tea Ice Cream, but our waitress came back to the table to tell us the tempura wasn't available. So, we switched our order to a serving of the Green Tea Ice Cream, to share. 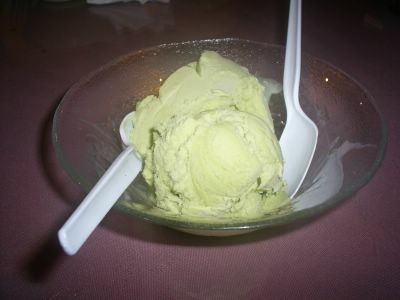 Possibly the best green tea ice cream I've tasted...and I have no idea why! It was just really, really good. Right around the time we were getting ready to pay up and leave, the woman who looks like my friend came around to clean up the five unattended tables around us (they'd been so busy with the LDKG, they hadn't gotten around to bussing the tables, or even picking up tips!). She asked us if we'd enjoyed our meal, and I felt pretty good telling her that I had. I also mentioned it was my first time eating Korean food, and she seemed pretty pleased. Chatted with us for a couple of minutes, and of course...asked us to come back! OMG. LOLOLOLOL at LDKG. i can totally picture them. i know exactly what you are talking about!!! if you actually went back in that room, you would have seen them - faces totally red and shiny from the alcohol. LOL!!! thanks sooo much to you (and matt!) for playing!!! mmmm kimchi is good. like spicy coleslaw. i love it. 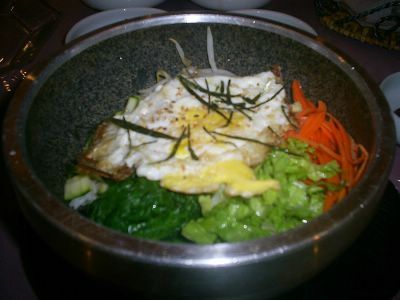 when we went to hawaii on our honeymoon we ate so much korean food. 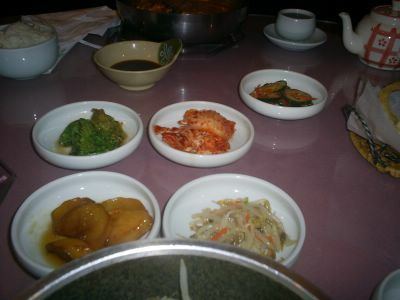 in fact if you get plate lunch, it's basically variations on korean food... yumm-y. however, i didn't get brave enough to try anything with a friend egg, so kudos to you! Sarah, I had a fairly good view of a couple of guys through the open screen, and yes; they were quite happy. I got the dish names; thank you so much! No, thank you. Because of Dine & Dish, we had a chance to try out a new restaurant...one we may not have otherwise. And Matt's decided he really likes this event! Really? See, I hate coleslaw. The only way I'll eat cabbage is huge, raw chunks of the stuff...and I haven't done that since high school track! The fried egg was fantastic...if you get the chance, give it a try. It adds incredible flavor to a dish. Oh...conveyor sushi! Love it. Isobune had this wonderful sushi boat-thing; they were they only ones in the Bay area to have them! You know, kimchee is truly incredible stuff. It's not really like coleslaw in the thick, mayo-covered way. And the flavour depends more upon the time of year that you get it. I'm a bit of a texture freak, so that's always going to factor in. But yeah; I'm working my up to trying it. Just not the first time! where in cali did you live? Im not used to the smoking/non question either since everywhere in cali is none. We just came back from Toronto and we had indian for dinner last night and thai for lunch. I just love ethnic food. Hi Randi! We lived in Oakland. But when we'd travel back to TN or PA, we'd get shocked back to reality by the hostess asking if we'd like to sit in the smoking on non-smoking section; it was just weird to have to deal with that after CA! Ireland's gone non-smoking, too...even in the pubs! Gotta love those Irish. Ethnic food is pretty great, isn't it? Blogging By Mail#3: Thanks, UPS Man!